The Federal Retirement system is one of the most complex benefits programs around. There are so many exceptions, special provisions, and exclusions that it can be difficult to keep track of your benefits. My name is Micah Shilanski. I’m a CERTIFIED FINANCIAL PLANNER™ professional who specializes in helping federal employees get the most out of their federal retirement benefits. I’m the founder of Plan-Your-Federal-Retirement.com. I’ve written articles for FedSmith. I’ve been featured in articles for NARFE and GovExec. 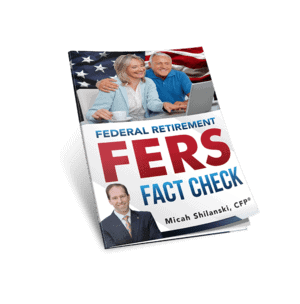 I teach FERS Pre-retirement classes. I’ve mentored other financial planners. And I’ve even had the pleasure of teaching online webinars and in-person classes with Tammy Flanagan. But my most important experience comes from working one-on-one with my financial planning clients. Most of my clients are federal employees just like you. I help my clients go from big picture to getting through all the nitty-gritty details to help them achieve the retirement of their dreams. This is different than the experience of most federal retirement experts. Because very few have had the same privilege to work one-on-one with federal employees through the entire federal retirement process – *and* continue to work with them for years afterwards. I’ve seen the mistakes that people (and even some professionals!) can make, and I want to help you avoid them. You can find lots of information online about federal retirement. But Plan-Your-Federal-Retirement.com is different. Because we approach your federal benefits from a financial planning perspective. Our goal here is to help you understand how your benefits work *and* how they fit into the rest of your financial picture. Because it’s important to understand your federal retirement benefits. But your federal retirement benefits are just one piece of your financial puzzle. The rest of the story involves how your benefit choices will impact the rest of your financial picture. Want to be sure you’re not missing important aspects of your retirement planning? Then you’ll want to be on the list to receive our ezine newsletter. Each month, we publish an original article on important retirement topics for federal employees. Your benefits are complex. But it’s worth the time to learn about them to make sure you’re not missing anything. You’ve devoted years, maybe decades of your life to federal service. It would be a shame to separate from service and miss out on benefits because you didn’t know about them. Make sure you get the most up to date information from Plan-Your-Federal-Retirement.com. Sign up for our ezine – just enter your name, email address and click “Subscribe”.